Did you ever read a story about onions? If you have not you must read this one. There once lived a man who loved travel and adventure.One day, a wandering preacher told him about a country where they have no onions. The man wondered how can any one take pleasure in their food with out onions. And decided to go there personally and introduce them to the lovely onions.He bought a load of onions and set off in his cart. He arrived in the country after a long journey. He went to the palace of the King. and told him about the new plant he brought which is unique and enhances the flavor of any food, and urged that the King must try it.The King said that he would try it, but if it proved to be harmful or tasted bad he would have the man’s head cut off.So the dinner was prepared using the onions, all the dishes were tasted before hand by the man to make sure everything was going accordingly. The ministers, the other guests and finally the king himself ate the dinner and the reaction of all those present was exuberant.The smell, the taste and the succulence of the onion were praised unanimously.The king immediately bought the man’s whole load of the cart and paid him its weight in gold. When he returned to his town, hearing his stories, his neighbor hit upon an idea that would surely make him a bigger fortune. Garlic! This was not only more precious, but infinitely more tasty and aromatic! He thought that, if they were giving gold for onions there, he could expect diamonds for garlic. And so he set off with five bags of garlic. Like his friend, he managed to be convince the king at the palace. And as he had expected, the garlic got even more praise than the onions.The king deliberated with his ministers for a long time about the reward for the noble guest. In their opinion, gold was not enough for such a delicious food, on which even God and His angels could feast. So they decided to reward him with the most precious thing they had to offer. I have read this story somewhere, but cannot remember the name of the site. I will surely credit the site when I come across it later, or if anyone knows it, please leave a commet so that I can credit it. 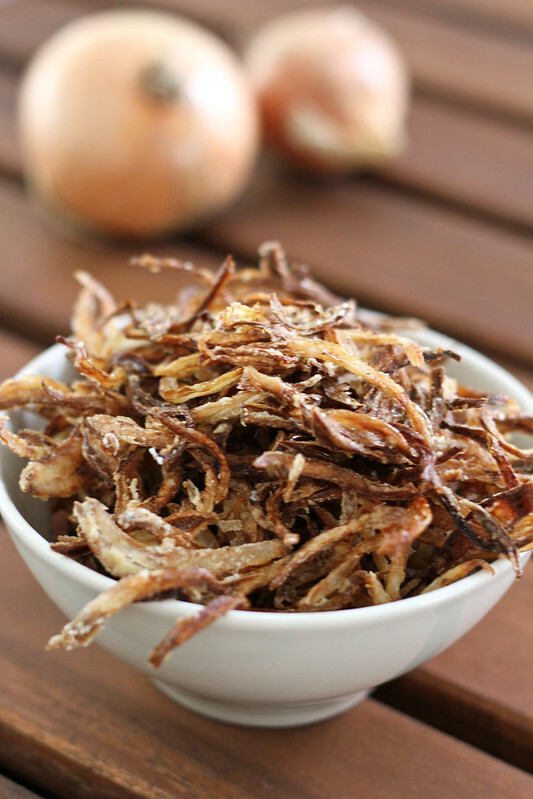 Fried Onions are very important while making Biryani, it enhances the flavor and give you the extra taste. You can make these a head in bulk and store in an air tight jar. Heat oil in a wide pan, the oil should be medium hot. When hot enough sprinkle some cornflour on the onion slices mix lightly and drop them in oil. Mix cornflour batch by batch, just before dropping the onions in oil. Fry till golden brown, stir once or twice in between. Remove from oil on to a paper towel. Transfer to an air tight jar, once they cool down completely. These stay fresh for about 2 weeks, if storing for long keep them in freezer. Fried onions can be also used in gravies – take some fried onions along with green chillies and coriander leaves and blend into paste. This adds a lot of flavor to the gravies. I love the idea of adding cornflour never done that next time will try. 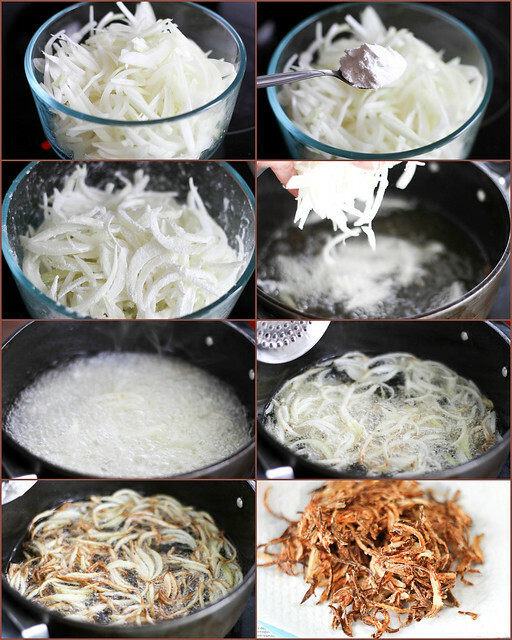 nice tips on frying onions dear…lovely post!!!!!! Luv the addition of CF. lovely clicks too.. Liked the onion story. So true. And there are times when the onion prices go up so high in India, that I would not mind the 5 bags of onions. And nice tip too. That is such a great tip and I had no clue they can stay for 2 weeks! Made biryani for dinner and I did caramelized the onions but mine never gets crispy! lol, loved the cute story! 🙂 i too add cornflour makes it so much crispier! Hey I love the story and thanks a ton for the tip on frying crisp onions. I have been looking around for a while to get them perfect. I sure will try them and I am sure they will come out perfect, coz they look soooo great.